If you create the bulk of your website and your online store in isolation, it will show through in terms of duplication of content or confusing navigation. And your customers will notice it. They’ll vote with their feet and buy from your competitors. How can you avoid this disastrous result and create an ecommerce website that actually flows, has a consistent message across all of its parts and encourages strong conversions of your visitors into website buyers? The answer to this lies in ensuring that you start right at the beginning – planning. You need to define your objectives clearly, and then choose a website builder platform that can help you deliver on them. If you’re planning to start an online business and looking for ecommerce software to run it, we’d most certainly welcome you to consider our solution but we’d urge you to take a minute to run through the steps in this article as it will help you understand exactly what will be important in choosing the right hosted software package to suit your needs. After all, you don’t want to get half way through building a website and have to change providers as the cart you’ve chosen doesn’t do what you want it to do (for the budget you have allocated). So, let’s get started. How do you choose the right ecommerce website builder? You might think that if you’re a small business, that you can just skip all of the planning work that larger organisations typically perform before commencing work on a project. The reality is that you must know all the details, and if you don’t properly plan your website (and entire business) carefully then you won’t be able to create an online store that really appeals to your customers. You can take the guess work out of the process, by first understanding who are the people who actually buy the product that you are going to sell. What do they share in common, what is important to them, and how do they shop? This part of the process is called defining a buyer persona. What you are trying to do is create an accurate picture of the type of person who will buy from you. Of a particular age? How old are they? 18-24, 25-34, 35-44, older? Analytical or Emotional shoppers? How will they buy this product? Does it require a lot of analysis and evaluation or is it a product bought on emotion? Visual learners? Does what the product look like make a difference to how they’ll buy it? Knowledgeable? How much do buyers already know about these products? Loyal? Do they already buy a similar or the same product from others? How often do they shop around when they need to reorder? Located in a particular area? Easy to ship to? Do they need shipping or will they want to collect their orders? These are just some of the questions you can ask yourself to get an idea of the buyer and how they shop. This will help you greatly down the track when you start to try to work out how you’ll reach them in advertising and at this stage of starting an online store, it will give you an idea of how you will need to target the customers. Unless your buyers need to be spoken to over the phone in order for them to make a decision to buy, an online store that’s integrated into your website will generally allow you to be more focussed on the buyer’s overall experience – and the website will load faster as it will require fewer add-on components to deliver all of the functionality that is required to get your customers through checkout. Once you understand more about your customer, you can start looking at the shopping cart providers on your shortlist to determine if they can help you sell to this particular customer. Will the customer you’ve defined find it easy to shop on the website you are creating? Do you need social media integration (usually the answer to this is … YES, OF COURSE!). What types of social media integration does the website provider have, and does it cost extra? For example, can you sell your products on a tab in your Facebook store? Can customers like and share your products by clicking buttons on the page? Can they add Facebook comments that add to the social media conversation from directly within your page? Is it easy for you to manage orders in the cart’s administration panel? A lot of time is spent looking at your customers (which is great), but if you forget about your business processes and how easy or difficult it will be to process orders once they’re placed then you could be heading for a bottleneck in getting orders managed and processed when they come in. Especially if your product is popular. There are lots of things to consider here, and this is just a short introduction to this topic. An entire piece could be devoted to just adding detail to creating a Persona and deciding on what features you need. 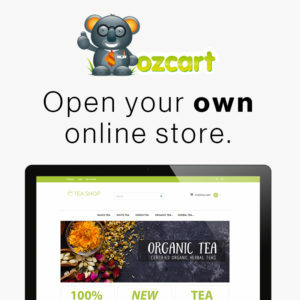 If you’d like to consider how Ozcart could help you set up and run your business online, then please take a look at our feature tour and pricing – or just get in touch with us and ask. We’re approachable and happy to help.